Despite being a good guy, Major Ned Talbot is a person who everybody loves to hate. Even his fellow soldiers call him "Noodle-Head Ned." His bumbling actions nearly cost the destruction of Gamma Base on more than one occasion. To make matters worse, he is the right-hand man to General Ross, and is also determined to destroy the Hulk. Talbot isn't shy to show off his feelings for Betty, even though the feeling is not mutual. Because of this, he harbors the most suspicion and resentment towards her fiancee, Bruce Banner. Okay, there really isn't a Ned Talbot in the Hulk comic book. 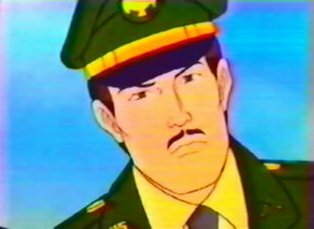 But everybody knows that this character is based off Major Glenn Talbot, who had the same feelings about the Hulk, Bruce, and Betty. Glenn was not nearly as inept as Ned, but his attempts to capture the Hulk frequently failed as well. Glenn did marry Betty however, even though she would later reveal that she loved Bruce more. Alas, Glenn Talbot died while battling the Hulk, and it doesn't look like he'll be back anytime soon.